Cash Caper is a rather unique slot game from Cryptologic. There is no pay table, instead you win what you line up in the form of real notes and coins. 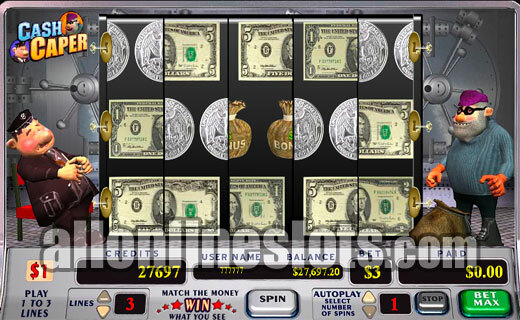 The game also has a bonus game where you can win extra prizes and free spins. Cash Caper is a great example of how something a little different from the usual can be really entertaining. It comes in two fixed coin sizes the 25c and the $1 version and features five reels with three horizontal pay lines. It also offers a two stage bonus game where you can win free spins. On the reels you will see a range of money symbols. On the US dollar version these go from a silver dollar to one hundred dollars and on the US 25c version they go from a nickel to one dollar. The symbols change if you play at a UK version of any of the casinos offering Cash Caper as they turn into Pounds Sterling which is a nice touch. All of the money symbols are split in half. You win by matching up the two sided of the symbols. Get a match and you win that amount of money. There are also bonus bags on the reels that activate the bonus. Unlike most slots the wins do not have to align to any side. In effect all of the symbols are scatters. Simply match two anywhere on the reels and you have a win. This gives Cash Caper a relatively high hit frequency. Align two parts of the bonus bag and you get to go into the safe. (View Bonus). The second screen game lets you choose one of six deposit boxes to reveal your prize. You can get a win value or a win value and a key. If you get a win value that amount is added to your win and the bonus is over. If you get a key the bonus game continues and awards free spins. 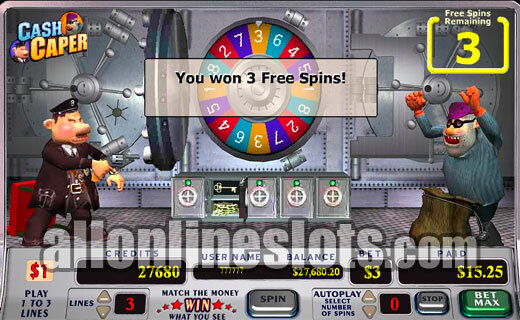 The amount of free spins you can win is between on and nine. On getting the key the main vault opens to reveal a Wheel of Fortune style wheel. This spins and where it stops determines the amount of free games you get. The free spins and the bonus can only be won if you are playing max bet of three coins. Overall, Cash Caper is a great game to play if you are looking for something that is a little more interesting than your usual video slot.